Chamber members are viewed more positively by their customers, learn from their peers and contribute to the effort to improve the overall business climate. Where is a good place to eat? Who do I call for home insurance? Who can fix my computer? The Chamber gets questions like this all the time, because consumers know that the local Chamber is the best source of information about quality businesses. We provide member referrals every day. All Chamber events are great networking opportunities! Facebook Promotion – Boost your business message or special event on our Facebook page, which has over 4,000 likes. What’s Up Weekly – Published every Thursday to keep members and community informed. Chamber members are allowed to put information in this communication. Free Ribbon Cutting – Chamber Ambassadors will come to your place of business to learn more about you! Getting current and reliable information about the Mount Pleasant area is vital to our businesses. The Chamber’s What’s Up Weekly e-publication and monthly Newsline publications help our Members stay in touch with business opportunities and community issues. The viewpoint of the business community is heard loud and clear at both the local, state, and national level thanks to the Chamber’s active Government Affairs Committee. The group creates an annual legislative priority list and promotes the priorities through monthly legislative briefings and annual trips to Des Moines and Washington D.C. The MPACC is the front door to access to hundreds of business professionals in and around Henry County. We help put you in connection with these business people by planning dozens of networking opportunities and meetings throughout the year. 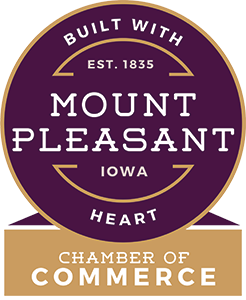 Want to send a special message to all 350+ members of the Mount Pleasant Area Chamber of Commerce? Mailing Labels – Consider purchasing mailing labels for $10 and take advantage of our bulk mail rate. For questions on doing a bulk mailing call 319.385.3101. When you choose to support the MPACC you are in turn investing in the community of Henry County. Our office fields phone calls from people all over the United States who are gaining information on Henry County and the businesses and people that make it up. As a member of the MPACC you can trust we refer people to our members first. When newcomers move to our community, often the MPACC is the first to hear about it. We create welcome packets with community & membership information in it for the newcomers to our community and do our part to make them feel at home in Henry County. New businesses and organizations enjoy numerous benefits that get them off to a great start!